I have made it my mission to help in any way I can organizations that are helping to negate the physical and emotional toll that cancer causes. I've had too many losses friends and family. So tonight I continue that help mission with "Taste For A Cause" a tasting event at Tocco (1266 North Milwaukee). 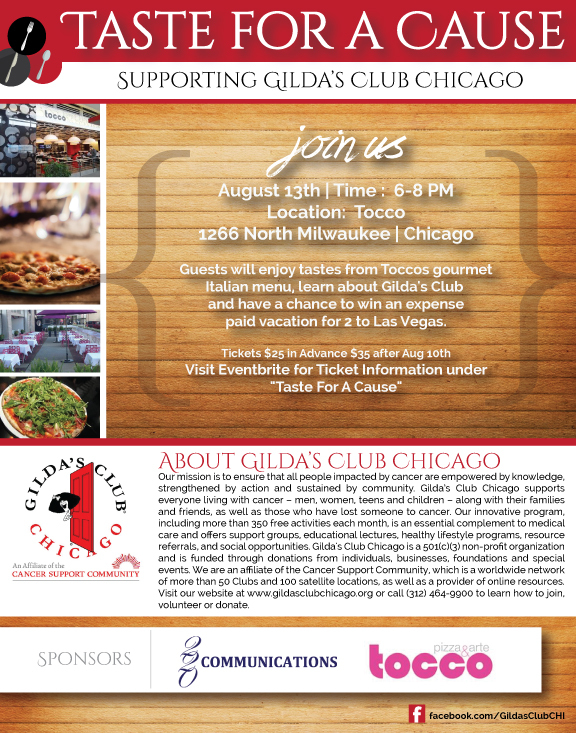 The supported charity for this event will be Gilda's Club Chicago. The event highlights menu items from a top lcoal restaurant as well as a non profit organization. Attendees have a chance to socialize, network and support all in one evening. A special feature of Taste For A Cause is a prize drawing for an expense paid trip for 2 to Las Vegas. Tickets are only $25 in advance and $35 at the door. Fresh ingredients, imaginative food and good service make Tocco worth repeat visits for us. Love their burrata, and the caprese salad is one of the best in the city. Haute design and great food make you think you're in Milan and not Wicker Park. The mission of Gilda’s Club Chicago is to ensure that all people impacted by cancer are empowered by knowledge, strengthened by action and sustained by community. So that no one has to face cancer alone™ – Gilda’s Club is a place where men, women and children whose lives have been touched by cancer, as well as their families and friends, can feel they are part of a welcoming community of support.